MetaStock Pro: Trader's Action Pack worth up to $488! Today's volatile markets call for serious trading tools. MetaStock Pro 12 is specifically designed for real-time traders—traders who use intra-day data to transact in real-time throughout the trading day, Whether you're an experienced, active trader or just learning how to trade the markets, MetaStock helps you succeed. MetaStock is powered by the incredible XENITH real-time data and news package. 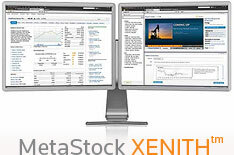 With real-time news & data, fundamentals, economic reporting, analytics, and much more, MetaStock XENITH is quite simply the most powerful platform available to the private trader. MetaStock XENITH is more comprehensive, more intuitive and more collaborative than anything you've ever worked with... and it's never been available to the private trader until now. MetaStock Pro (purchase) Receive $488 in free products, services and discounts!